From the first time I read a book by Ms. Wingate, she captivated me with her stories and writing. I was very excited to read this book and it far surpassed my expectations. I am intrigued my fictional novels that are based on true stories. The facts are true but how they are made play out in the charactersâ€™ stories lies in the hands of the author. Through Lisa Wingateâ€™s talent and writing skill, these individuals were literally brought to life, so much so I had to keep reminding myself they were fictional! Until this novel I had never heard of the Tennessee Childrenâ€™s Home Society spearheaded by Georgia Tann. From the 1920â€™s through 1950â€™s, hundreds of children were kidnapped by abduction or trickery from loving and caring parents. Until they were adopted by wealthy or famous people, for a hefty fee, they suffered unimaginable physical abuse, sexual assault, neglect, and with some even death. In 1939 a young girl, Rill, and her siblings lived happily in poverty on a house boat with their parents. While her father and mother were at the hospital welcoming another child they were snatched away and taken to one of Ms. Tannâ€™s â€œhomesâ€�. That was when the nightmare began. As if the heartbreak of being separated from their parents was not enough, Rill also felt the pain of trying to protect her younger siblings and keep them together in an environment of cruelty and violence. My heart broke at the horrors these children encountered. I never imagined! The chapters alternate from Rillâ€™s narrative to Avery Stafford in the present day. Avery is 30, wealthy, privileged and the member of a prestigious political family, totally opposite to Rillâ€™s experience. When Avery attends a nursing home tour a resident appears to recognize her. She returns to visit her. In a sepia photo in May Crandallâ€™s room she sees a family. One of the children strongly resembles her grandmother. She cannot get it out of her mind and begins to relentlessly seek out answers about her Grandma Judyâ€™s past. Could May be a part of that past? Due to dementia claiming her grandmotherâ€™s once sharp mind she cannot ask her questions. Itâ€™s all up to Avery. What secrets will she unearth? How will they change her and her familyâ€™s lives? I couldnâ€™t turn the pages fast enough! An incredible book with an amazing story! 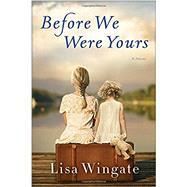 Thank you, Lisa Wingate, for giving me the opportunity to read and review this book. The opinions I have stated are my own. Wow!! Lisa surpassed herself once again. What a great book! I love historical fiction because you get to learn a bit of history while reading an intriguing story. Lisa keeps you in suspense as you follow Rill in the 1930â€™s and Avery in present day. Itâ€™s sad to know that the Tennessee Childrenâ€™s Home Society was anything but helpful to families and orphans and that this is based on something that actually was taking place back in the 1930â€™s. Lisa does a wonderful job engaging you in the characters, their fears, hopes, and struggles along the way. Her characters and books have never disappointed me. I highly recommend this book and always look forward to her next book release. I received this book free from Penguin Random House in exchange for my honest opinion. Before We Were Yours: 5 out of 5 stars based on 2 user reviews.